Because Nothoscardum ostenei flowers late in the season it was one of the plants that flowered during one of our warmer sunny periods which has resulted in a good seed set on this pretty little South American bulb. I have had seed before and here is some seed sown in June 2005 so it has had the chance to grow for three seasons but as you can see from the different sizes of the bulbs it germinated sporadically and what you can see above are seedling bulbs of both one two and three years old. 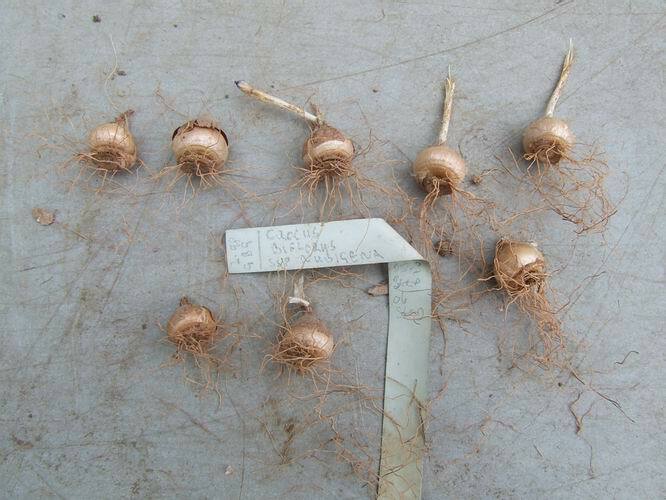 It is very common for bulb seed to germinate sporadically and this is one of the reasons that it is best not to repot them after the first year. 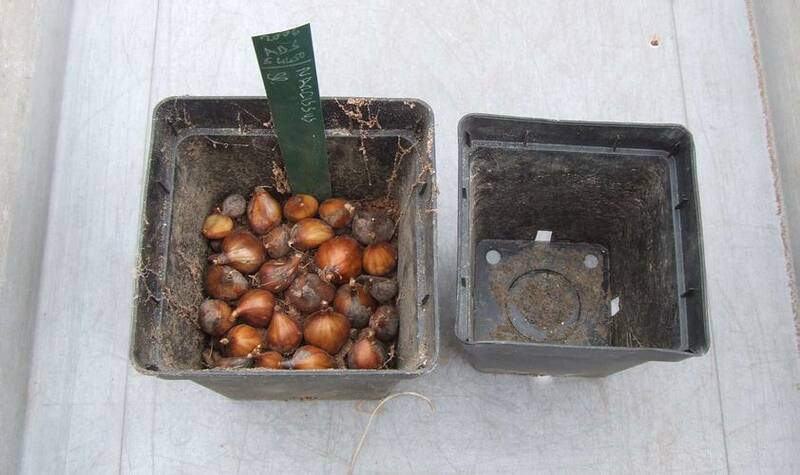 Unless you are sure that you have a good early germination I would suggest the end of the third year is the best time to do the first repot of bulb seedlings - by then most of the viable seed will have germinated and the bulbs should be a reasonable size to find and handle. 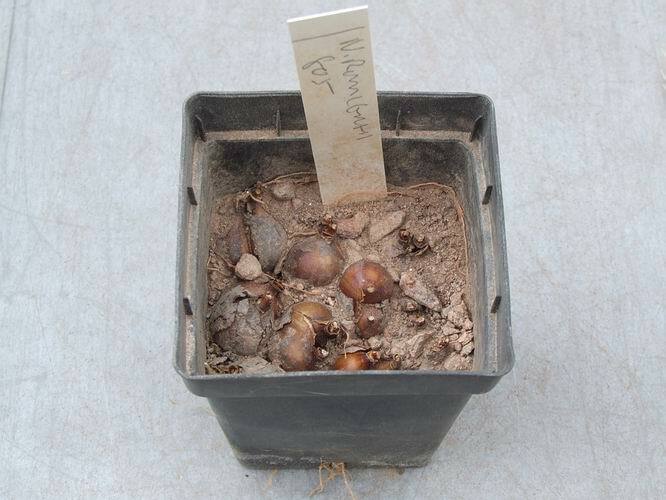 I have left these Fritillaria lusitanica seedling bulbs for the same three year period before re-potting and again you will observe the different ages of bulbs indicating the sporadic germination. One very important observation you must make when repotting seedling bulbs for the first time is the depth in the pot that they have taken themselves down to. Fritillaria seedlings generally attain their favoured depth quickly by the way the new bulb forms at the end of the radical root and it is important if you want the bulbs to do well to make sure that you replace them at that same depth when you repot. did not give them sufficient water for them to grow well. 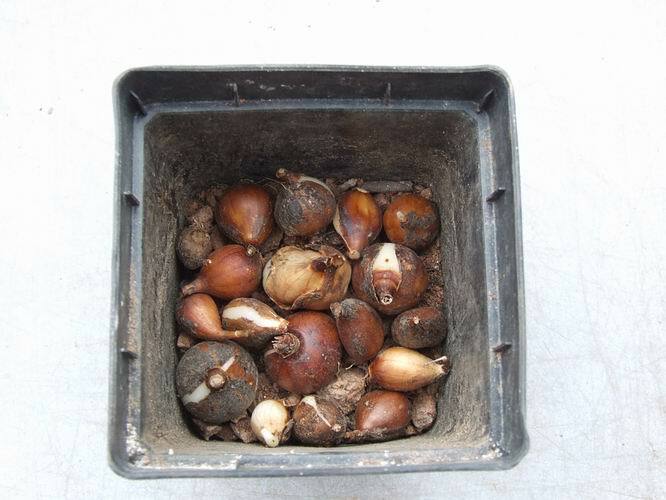 This time last year I was finding many of the pots contained lost of small bulbs in place of the flowering sized bulbs I was used to. 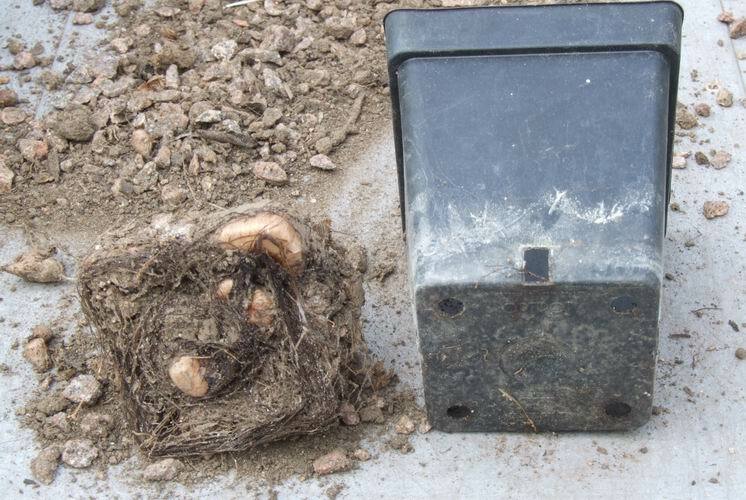 This was the survival reaction of the bulbs kicking in as they broke down into lots of small bulbs because while there was enough moisture to keep them alive there was insufficient water for them to grow and increase well. I have not made that mistake this past year as I reverted to a regime of providing the bulbs with plenty water when they were in active growth. 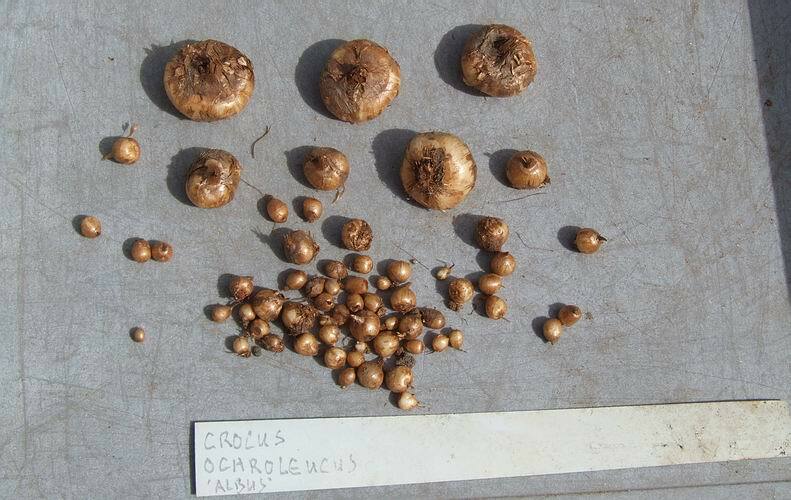 The pot of Crocus hadriaticus corms above shows that the trend of breaking down into small bulbs has been reversed and that the small bulbs are now swelling into healthy flowering sized bulbs. Our bulbs are very good at telling us what they want if only we are observant enough to see the signs. 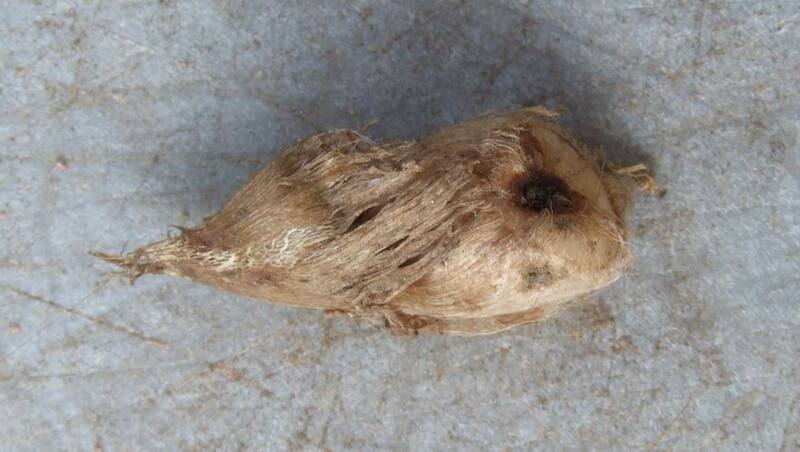 This corm is telling me that it wants to be planted deeper than it was -the elongated shape of the corm and the new corm forming below the tunic of the old one are obvious signs that it would be happier planted a bit deeper in the pot. To further illustrate this point here is a pot of Crocus corms that have not been re-potted for at least two years and notice how they are now at the bottom of the pot. Here again the corms have in the course of two seasons of undisturbed growth taken themselves to the bottom of the pot and would, I am sure, have gone even deeper if they had the opportunity. Another pot of Crocus hadriaticus corms are increasing well having split into many smaller corms under my bad management last year. They are now increasing in size and growing healthily with my improved watering. 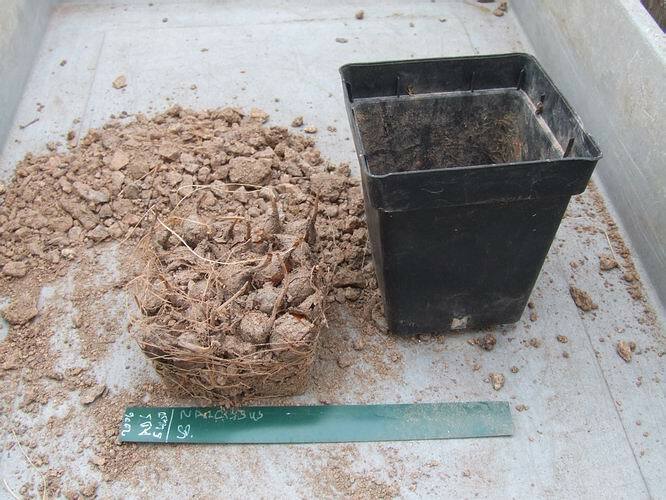 It is always reassuring to find pot after pot doing well but I can assure you that there will always be failures and I will bring these to your attention over the coming weeks when I encounter them. 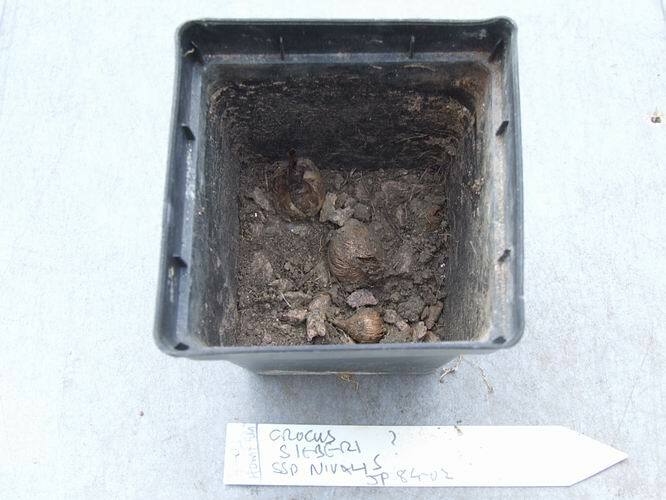 Here are the contents of a pot of Crocus biflorus ssp nubigena corms before I clean them up. I enjoy studying the beautiful tunics that surround the corms. A gentle rub in between the palms of my hands is sufficient to remove all the loose remains of the old roots, stems and tunics and leave the corms ready for replanting. 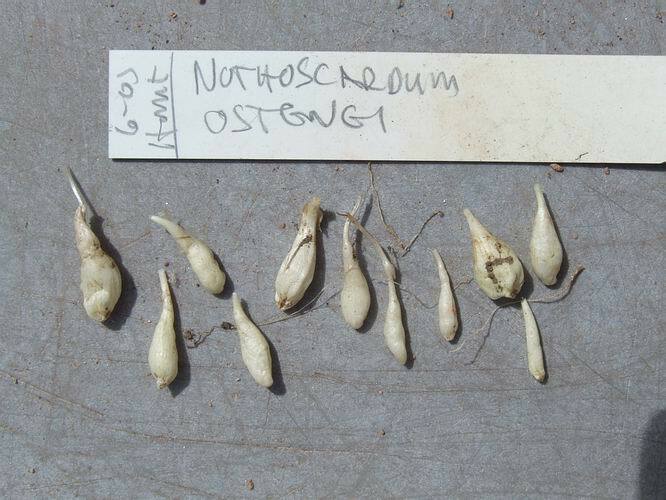 The large number of small cormlets seen here are not down to my bad management but Crocus ochroleucus is one of the species that produce quantities of small offset corms as well as flowering sized ones when they are growing well. While on the subject of Crocus I would like to say thank you to David Stephens who is retiring after twelve years from the position of Hon. Secretary of the Crocus Group. With 184 members the Crocus Group does great work by keeping the serious Croconuts of the world in touch with each other; disseminating knowledge and exchanging seeds. Tony Goode is taking over from David and anyone interested in joining the Crocus Group should contact him. 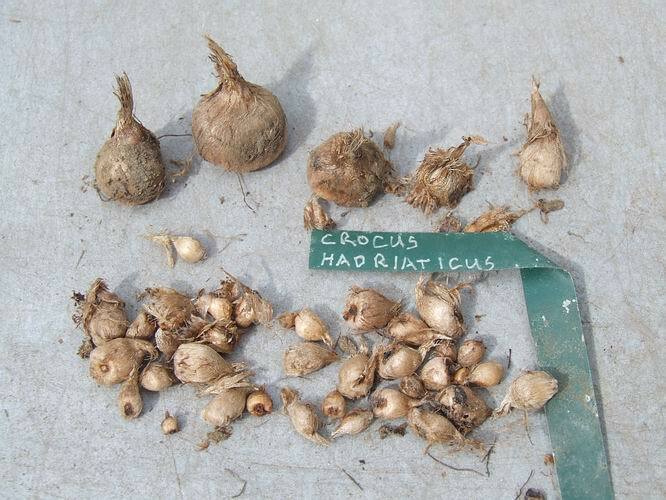 We have a very active Crocus section on the SRGC Forum and you will be able to find a link to contact Tony there. My impatience leads me to jump to a few Narcissus pots and again the planting depth of the bulb is critical to its efficient performance. If the bulbs are happy at the depth they are growing they will be true bulb shaped but if the bulbs are elongated in shape that is usually a sign that they want to be planted deeper. As with the crocus corms I gently rub the Narcissus bulbs between my palms to clean off the loose material before re-potting into a slightly bigger pot in this case. I have to be very careful in how many larger pots I move up to as I have very little room under glass to expand into - in fact I have no more room under glass so for every pot that is scaled up something has to go the other way. With my problem of space in mind I cram as many bulbs into a pot as I can get. 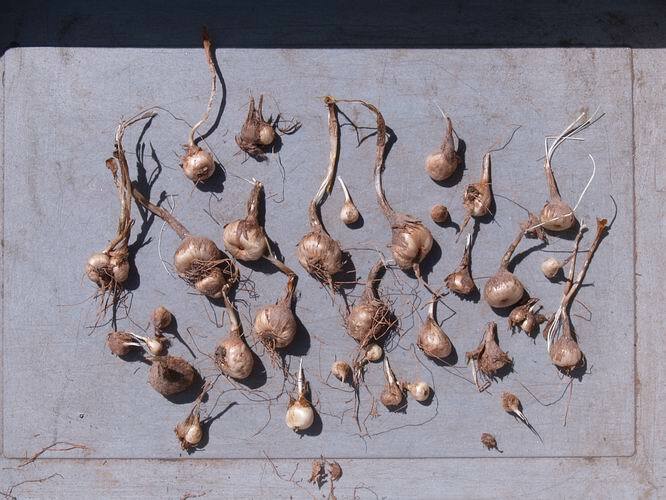 I have found that the bulbs like to grow like this and many perform better when planted like this than they do if they have plenty of space and are surrounded with nothing but compost. 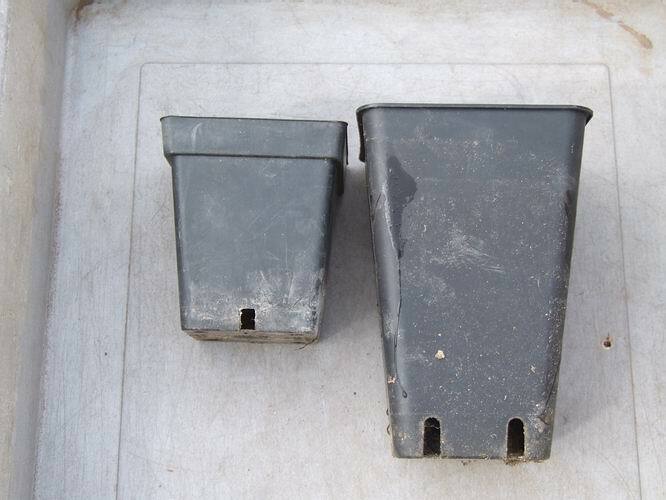 One way to increase the volume of compost is to use deeper pots - this also helps with the bulbs that enjoy being planted that bit deeper than is possible in normal pots. One rule never covers all and while many narcissus bulbs like to be planted quite deep in the pot I find that some forms of Narcissus romieuxii do best for me if planted no deeper than half way down a pot - this story will continue as I will be spending the best part of July and August re-potting bulbs.